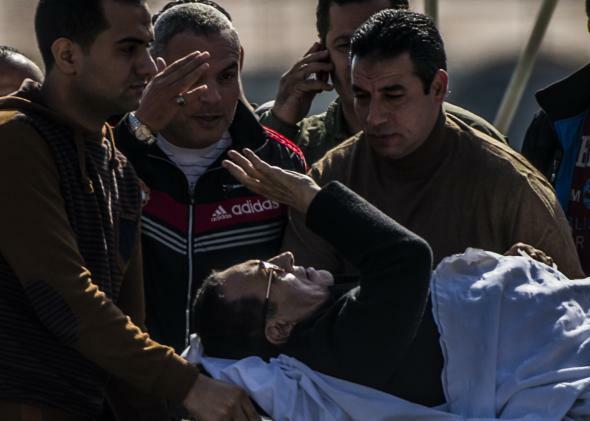 Egypt court drops Hosni Mubarak murder charges. Egypt’s former president Hosni Mubarak (C) waves as he is transported from a military helicopter to the ambulance outside Maadi military hospital in Cairo. Three years after a pro-democracy uprising that inspired the region, a court in Cairo dismissed all murder charges against former Egyptian president Hosni Mubarak over the killing of protesters. The decision raises the prospect that the former dictator could walk free for the first time since he was ousted in 2011, although his release is not seen as imminent, because he is serving a three-year sentence on corruption charges. The former dictator has spent almost his entire time since he was ousted from power in a military hospital and was brought to court on a gurney. The trial ends a four-year process that included a life sentence in 2012, which had been overturned on a technicality in 2013, reports the Wall Street Journal. Mubarak’s two sons, his security chief, and six top security commanders were also acquitted of all charges, including corruption. The ruling marks another major setback for the young activists who spearheaded the Arab Spring-inspired uprising nearly four years ago—many of whom are now in jail or have withdrawn from politics. It will likely reinforce the perception that Mubarak’s autocratic state remains in place, albeit led by a new president, former military chief Abdel-Fattah el-Sissi. The murder charges for directing police to kill unarmed protesters were difficult to prove because of the many layers in the Egyptian military’s chain of command and the broad latitude for self-defense often given to the police. The corruption charges appeared to have been thrown together hastily without a thorough review of the many other allegations that surrounded Mr. Mubarak’s 30-year rule. In an earlier trial for the same charges, a judge found Mr. Mubarak responsible for the killings of the protesters and sentenced him to life in prison. But that judge’s verdict appeared to acknowledge a lack of evidence, acquitting those below Mr. Mubarak in the chain of command. That judge also dismissed the corruption charges on technical grounds, and, as expected, an appellate court threw out the verdict and ordered a retrial.